The drums are the foundation of the tempo, dynamics, and energy for most popular music forms and a well-recorded drum kit is often the basis of a great recording, whatever the genre. In this article we'll look at a number of proven studio techniques and practices for miking a drum set, and apply them to the recording process in the home, project studio, or location environment. It will be easiest for you as an engineer to think of the drum set as a single, unified musical instrument with adjustable parts which must be tuned, positioned, and prepped prior to any microphone placement. Much of the preparation can and should be done in advance by the drummer. Adjust all the lugs, both top and bottom, for even tension and tightness of the drum head. A well-tuned drum head will "speak" the fundamental pitch of the drum in a pleasing way with consistent decay. Tap each lug with a drum stick while depressing the center of the head with a finger, and adjust the lug accordingly until the same pitch is produced at each lug-point. The bottom head is often tuned 2-6 semitones higher than the top head – whatever best produces the drum fundamental. This is particularly evident with the tom-toms. For increased decay, or what we hear as the "dooooong" from the toms, detune one of the bottom lugs until you achieve the desired decay length. Be careful not to loosen the lug too much, as rattling and buzzing may result. Bass drum heads are tuned just like the other drums, though often the rear head is either removed or has a hole cut in it. The hole is usually cut either facing the drum pedal beater, or off to the left side as you face the head. Double bass drums project best when tuned differently, with one 2-4 semitones higher than the other. The difference in pitch is not perceived, and the definition between the two is much better. Avoid damping the drum heads when possible – as we've mentioned, proper tuning will remove most undesirable overtones. You should consider simply not using a particularly problematic drum, since heavy damping will make it sound inconsistent with the rest of the kit. Proceed to the microphone locker. 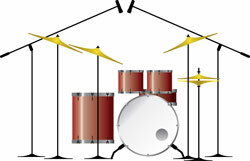 Where you choose to set up the drum set will depend on the size and character of the space itself. As a general rule, corners create increased low-end response and hard, smooth surfaces reflect higher frequencies from the cymbals and snare. Padded surfaces and carpeting will "deaden" the sound by absorbing high frequencies. Set up the overhead microphones first. 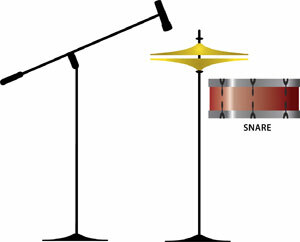 A pair of large-diaphragm condenser mics, positioned as a spaced-pair 2-5' apart at a height above the head of the drummer will often give the best left-right stereo perspective of the drum kit as a unified instrument. The closer the spacing between the mics, the narrower the stereo image will be. Coincident pairs 2-6" apart at a 90° angle will give a stronger center-image that folds well to mono and will pick up less sound from the far left and right. Some engineers prefer positioning the overheads in front of the kit for more toms and kick drum and less cymbal presence, some prefer a setup behind or next to the drummer. 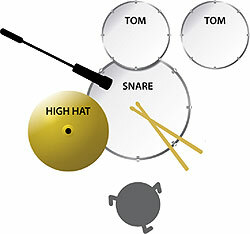 The precise placement will depend on where and how high the cymbals and toms are mounted. Experiment, and be sure to allow the drummer and his sticks maximum freedom of movement. By starting with the overheads you'll be able to immediately monitor any aberrant tunings, squeaks, and rattles. You'll get a good feel for the consistency and blend of the kit's sound, and also get a sense of the drummer's finesse, or lack of it. Heavy-hitting basher types will often strike the cymbals and drums with equal ferocity, in which case the overheads should be repositioned higher to avoid excess cymbal level in the recording. You'll also get a better feel for the appropriate gain and compression levels of the individual drum mics. Cardioid pickup patterns usually work well with overhead mics and offer the best stereo separation, but many engineers experiment with omnidirectional and figure-of-eight patterns to introduce more room ambience. Don't forget to check for phase anomalies in any multi-mic configuration. Cymbal phasing (a noticeable "swish" in the sound) is common and easily fixed, though sometimes pleasing and usable if it works with the track. A good bass drum sound is often a highly personal matter of taste, and preference, for timbre and level within the mix. In general, the close-miking of a bass drum is best accomplished with a large-diaphragm dynamic microphone. Dynamics tend to be less sensitive and less prone to distortion and spill from adjacent signals. A cardioid (or tighter) pickup pattern works best for all close mics, offering optimal isolation and enhanced low end introduced by the proximity effect. Assuming the front head has been removed or a center-hole has been cut, the best place to start is by placing the mic a few inches to halfway inside the hole or rim, aimed directly at the beater on the batter head. If that seems to produce too much click (attack) sound, aim the mic a bit off center. The beater itself will make a difference; felt beaters produce more of a thud, and wood or plastic beaters produce more clack. Conversely, click fanatics will often place a second mic aimed at the beater on the batter head of the kick as well to achieve more attack sound. A second mic may also be necessary for the batter head to achieve more attack sound in the event that the front head is left on and has no hole cut in it. Some choose to place the mic entirely inside the shell of the drum, a process that usually requires some internal baffling with pillows, sandbags or thick foam. While this technique tends to produce a more "dead" sound reminiscent of old-school disco and So-Cal rock recordings from the 70's, it will certainly give you a drier, more manageable thud to the low end if that's what you're looking for. As always, feel free to experiment; the settings above are good starting points. The snare drum should be properly tuned and the snares adjusted to produce the best natural sound of the drum before you position the mic. Small-diaphragm dynamic mics or condensers with a high SPL capacity work well sonically and practically – they fit in that tight spacing around the snare between the hi-hat and the tom-toms. A good starting position is near the rim of the snare in the middle of two lugs, aimed at the center of the drum and angled slightly downward. The farther the mic is from the drum, the less attack and the rounder and more ambient the tone. Snare drums sound best when an even blend of hit attack and tonality is achieved. Don't forget that the snare is also being picked up by the overheads, so it's a good idea to keep referencing the overhead sound while miking or applying EQ to the snare. Many engineers have achieved good results by positioning a second mic on the shell of the snare drum off-center from the hole, or on the bottom head, and blending that signal in with the top head microphone to add more body and depth to the sound. Don't forget to check phase regularly as you start piling on the microphones! Tom-tom microphones may be positioned very much like the snare drum mic, aimed toward the center of the drum head and downward, with smaller-diaphragm dynamics working well for the high toms and larger-diaphragm dynamics proving suitable for the floor toms. Again, proper tuning of the toms is essential to achieving a good sound. Some engineers prefer to use one mic per tom, others have success placing one mic in the middle of each pair of high toms and using one mic for each of the floors. Large- and small-diaphragm condenser mics may also be used for recording the toms in musical settings where the thunderous dynamics of rock and pop are unnecessary or inappropriate. Condenser mics are usually more sensitive and offer more subtle detailing, but they're also more prone to distortion, leakage, and physical damage from sticks or mallets. For recording brush work or a high-finesse jazz drummer, condensers are often the right choice. The compression settings listed above for the snare drum will work well for the tom-toms as well. Even though the hi-hat has a fairly ubiquitous presence in the overhead mix, it's usually a good idea to mic it individually, using a small-diaphragm condenser mic with a high SPL tolerance and a tight pickup pattern to prevent leakage from the adjacent snare drum. Before you do any serious mic placement, remember to roll off any frequencies below 250Hz. These are just "junk" frequencies such as stand and pedal rumble, low-end leakage and other frequencies not in the hi-hat's range that ultimately detract from the sound. Positioning the mic is tricky because capturing the attack and shimmer of a well-played set of hi-hat cymbals usually requires close proximity to the point where the drummer's sticks hit the cymbals, yet maintaining enough distance from that point so that the mic is not struck. It's also a good idea to use the low frequency roll-off switch on the mic, if the cymbals sound a tad "boomy." A large-diaphragm condenser microphone set to an omnidirectional or figure-of-eight polar pattern will often produce some stunning results when used essentially as an ambient mic. Feel free to explore the various corners and surfaces of your space with the mic and a set of headphones. By allocating a separate track to the room mic and properly blending it in the mix, you'll often introduce both a more open and gracious sound to the kit, and an enhanced kick drum presence that the close mics can't offer. 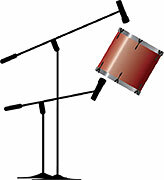 Speaking of track allocation, the snare, kick drum and hi-hats are typically allotted separate tracks, with the hi-hat panned near- or hard- right and the snare and kick centered. The toms will often get a left-center-right treatment spread across multiple tracks and be panned accordingly, while the overheads are presented in a stereo left-right field. This is basically a "visual" audio representation of what you see when you face the drum kit of a right-handed drummer. Many proponents of the minimalist school of engineering still achieve some pretty outstanding results with 2 or 3 microphones at the most - back in the day that's how it was done. Today we often have more tracks and options available to us for tracking at home than the legendary rooms of yore ever had, but the classic, proven techniques discussed in this article are still absolutely relevant to the modern digital recording process. Compression, as they say, is your friend, and a great creative tool, but don't squash the drums to the point of lifelessness. Move the mic around before you grab the EQ, but try not to be too precious and time-consuming about your mic choices and placement. Forty-five minutes to an hour should be plenty of time to achieve a good sound. The performance still comes first, and a bored or fatigued drummer is not going to lay down a great track. Now, let's do it! Below you'll find a list of useful gear for recording a drum set. Please email feedback on this article, or suggestions for future topics, to audiofeedback@bhphotovideo.com.